Oh dear. Don't let the floppiness of the above photo put you off; I have no clue how people manage to take good photographs of ice cream before it melts. This is a great pudding for an evening, when you want something easy, but a slight step up from a couple of scoops of ice cream from a tub. The praline is a doddle to make and can be kept in an airtight container, wrapped in greaseproof paper, for ages and ages, so be sure to make up a generous batch. 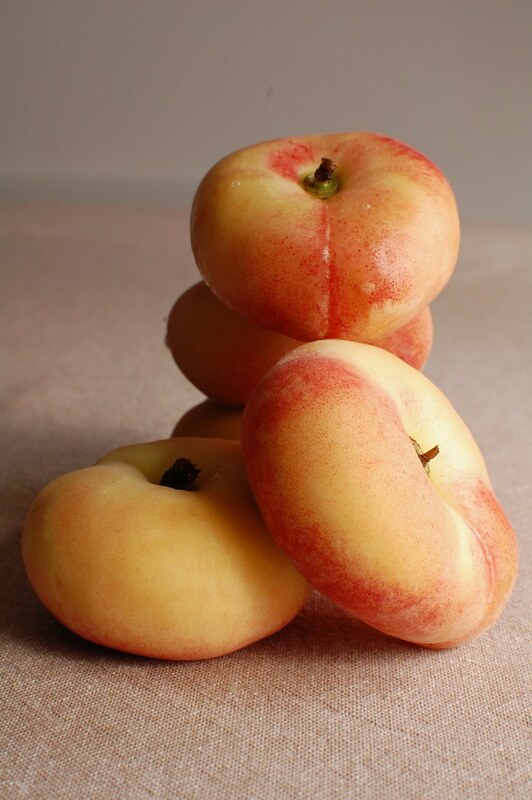 Doughnut peaches can be found in all good greengrocers right now. The ones I used here were piddly, compared to the whoppers I've been buying from a fruit stall on High Holborn. But I did get ten for £1.50, so I can't really complain. For those of you who haven't tried doughnut peaches, they are sweeter than regular peaches, less furry and have an almond taste to them (but still taste of peach). They are also easier to eat, by the virtue of being flatter and having stones which can be easily pushed out of the fruit. They are also one of my out-of-bounds fruits, due to my OAS. However, they don't trigger a really bad attack, just an itchy throat for an hour or so, so I just about get away with eating them very lightly grilled, with an antihistamine for afters. Prepare some greaseproof paper, ready for pouring the praline onto. Roughly chop the pistachios. Put the caster sugar into a saucepan over a low to medium heat. Shake occasionally until the sugar dissolves into a light golden caramel. You now need to work quickly. Immediately stir in the salt if using, followed by the pistachios. Pour onto the prepared greaseproof paper and using a large spoon or spatula, press the mixture into as thin a layer as possible and leave to cool and harden. Once cooled, use a pestle or rolling pin to break the praline into shards. Leave some pieces like this, use a food processer to grind others into a fine praline dust. Heat the grill (or griddle, if you want the nice stripes) to medium-high. You want it hot, but not smoking. Put the peaches on the heat source, skin-side nearest to the heat first. Cook for 2-3 minutes on each side. During the final minute of cooking, splash some Amaretto onto the peach surface. 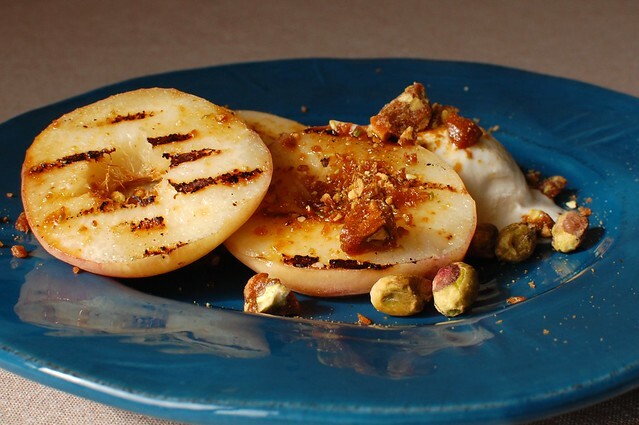 Spoon the peaches onto a serving plate, immediately sprinkle over the praline, so it catches the heat a little. Serve with ice cream. Almost any combination of soft fruits and nuts works here, but try plums and hazelnuts, apricots and almonds, or if you have some maple syrup, try a maple sugar syrup with pecans to make a praline, which will go tremendously well with pears.